: Geo. Zoltan Lefton Co. / Lefton-Pacific Inc.
Lefton was located in Chicago (under the name Geo. Zoltan Lefton Co.) as well as Los Angeles (under the name Lefton-Pacific Inc.) and in the 1950s and 60s imported items mostly made in Japan. The items perfectly fitted the American taste at that time while the European market disliked both shape and color settings. 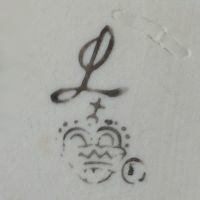 The marks shown here are only a few examples used by Lefton and are often misrepresented by sellers or cause confusion because they are not easily identified by inexperienced buyers. 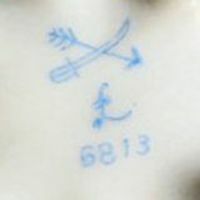 No dates known, the Geo. 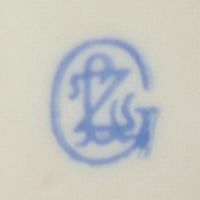 Zoltan Lefton initials 'GZL'. 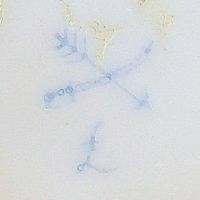 No dates known, crossed arrow and sword above a double-slashed 'L' (here without an item numner). No dates known, same as before but this time accompanied by an item number. 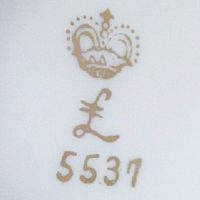 No dates known, double-slashed 'L' under a crown. No dates known, slighlty clearer example that does not look quite as simple as the others. 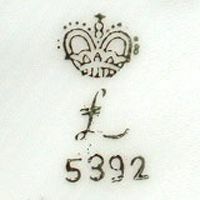 No dates known, capital 'L' above a crown (and a ® mark).